If you’re searching for a regal and classic desk for the office, you can’t go wrong with traditional office furniture design. 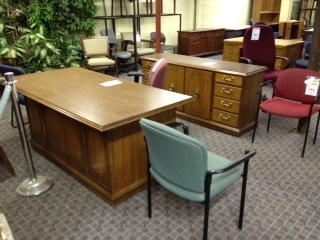 One office furniture must have item is a traditional office desk. This furniture item will establish an impressive style to your office setting while enhancing your business professional image. Wood office furniture is timeless and enduring in perennial style and solidly crafted material, your office desk will surely meet the highest standards of interior design excellence. The reason a traditional style desk is so appealing comes from the guaranteed workmanship and craftsmanship that comes with the finest authentic wood office furnishings. Some beautiful finishes that come with traditional office desks furniture are natural walnut, old world mahogany, crescent cherry, landmark oak, sunrise maple and amber cherry. Best of all is that the traditional style desks will still provide you the functionality you expect from a modern desk. If you need a beautiful traditional office desk, well designed, used traditional desks at very affordable prices, contact Mark Downs at 1.800.281.3696, take a look around our website, and come on in and see us! This entry was posted on Friday, November 16th, 2012 at 6:49 pm. Both comments and pings are currently closed.